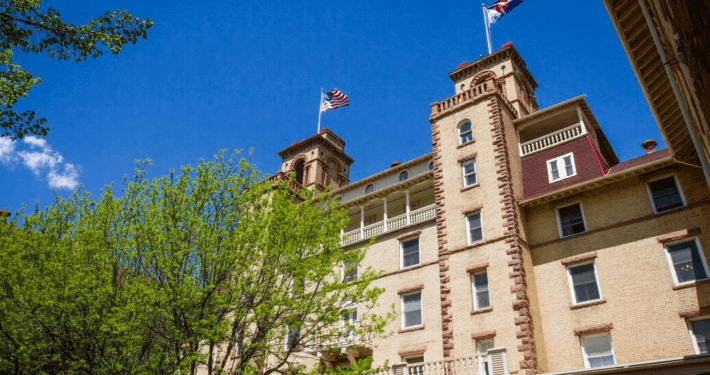 Tucked among the red rocks and cliffs not far from Glenwood Springs, waterfalls, a castle, marble statues and more cast a spell of enchantment. Some places are magical. The drive to Redstone, Marble and to the top of McClure Pass is one of them. The best part is you don’t need a magic wand to see marvels appear before your eyes—just factor in some extra time on your Glenwood Springs vacation for this side trip that unveils some of Colorado’s most beguiling sights. From Glenwood Springs, take Highway 82 south towards Aspen. Exit at Carbondale and continue on Highway 133 for approximately 16 miles to the main Redstone entrance. Surrounded by towering red-hued cliffs, Redstone enchants any time of year. Once a coal town, it’s now a hamlet of Victorian homes and shops. Park the car and stroll along Redstone Boulevard, a two-lane blacktop where cars give way to pedestrians, cyclists and roaming pets. Wander in and out of boutiques with owners as colorful as the merchandise on the shelves. Then, take a rest at Redstone Park where you can skip a few rocks into the Crystal River as it tumbles and churns past. Leaving town southbound via Highway 133, make a quick stop to see the remains of the beehive-shaped ovens once used for processing coal. Travel back in time with a visit to a real castle. The Redstone Castle was built in the Tudor style in 1899 as a hunting retreat by business tycoon John Cleveland Osgood. Originally named Cleveholm Manor, Redstone Castle anchors the mountain hamlet of Redstone, in the magnificent Crystal River Valley. Placed on the National Register of Historic Places in 1971, the Castle provides a unique glimpse into the personal styles and social culture of America’s elite at the turn of the 20th century. No expense was spared constructing and furnishing the residence. Highlights include wood paneling by Gustav Stickley, stained glass Tiffany lighting, Persian rugs and furnishings collected from around the globe. Information about Redstone Castle Tours HERE. Waterfalls are as mesmerizing as sun catchers hanging in a window, teasing the eye and delighting the senses—they also make for spectacular photos, so be sure to pull off for a photo-op at Hays Creek Falls, just two miles south of Redstone. During peak run-off season the falls are a raging tumult of whitewater; at other times of the year, the falls resemble a soothing fountain. Either way, you’ll be glad you stopped. Whereas Redstone is refined, Marble is rough-and-tumble. Fishing, jeeping, hiking, camping and mountain biking are just a short-list of things to do here. While outdoor pursuits rein supreme, there’s also an artistic side to the town that’s literally carved in stone. Named for the pure white rock found here, Marble is home to several sculpture artists whose work can be seen in galleries and along the roadside. Though no tours are currently available, it’s interesting to note that the marble mined from the quarry here is on display for the world to see—in the Lincoln Memorial and the Tomb of the Unknown Soldier in Washington, D.C.
As one of the most photographed places in Colorado, the Crystal Mill is a spellbinding sight. Perched on an outcropping of rock above the Crystal River, it is framed by a backdrop of aspen and stunning mountain views. If you go, keep in mind the Mill is only reachable in the summer and fall months by four-wheel drive, mountain bike or by foot. For the four-wheel novice, guided tours are available—a good way to keep both your nerves and your vehicle intact as you traverse this rugged and awe-inspiring terrain. Last, leave it to Mother Nature to arrange the ultimate scenic wizardry. A drive up McClure Pass any time of year is an eye-popping experience, but in autumn it’s considered one of the most visually striking fall foliage excursions in the state. Take in the vistas at the top before your scenic return to Glenwood Springs. Even if you don’t believe in magic, this scenic drive will enchant you with all it has to offer.